Staying focused at work during times of trouble at home can be extremely difficult. A divorce, death in the family, or other traumatic event can turn your entire world upside down. So how are you supposed to care about work (much less stay focused at the office) when your entire life feels like it’s been uprooted? Remember how important your job is. When things become stressful at home, it can be easy to want to put your responsibilities at work on hold. And while this is understandable and permissible for a short period of time (immediately after a family member’s death, for example), it’s important to realize that this cannot become a long term solution. During tough times, you will find that most people (your employer included) will sympathize with you for a while, but in time, they move on – whether you have or not. Some people fail to realize this and continue in their slump, often to the detriment of their reputation at work. It’s hard to care about your job right now, but it’s important to remember just how important your job really is. Ask yourself, as bad as things are right now, how much worse would they be if you were to lose your job? Hopefully, the thought of this will be enough to motivate you to get your work life back on track, because as difficult as it is to imagine, if you consistently fail to make your performance at work a priority, you very well could find yourself unemployed. If you know that you’re going to have a hard time focusing at work, take the time the night before to carefully block out your schedule for the following day. And when you’re at work, stick to your schedule. Knowing exactly what has to be accomplished in a given work day helps you to stay focused on the task at hand, and if you keep yourself busy, you’ll have little time to dwell on the negative aspects of your personal life that could otherwise sabotage your productivity. 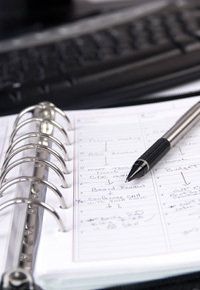 When creating your schedule, try to find a balance between busyness and idleness. You want to keep yourself busy, but you don’t want to schedule so many tasks that you feel overwhelmed or stressed. So plan a full day, but don’t forget to leave room for breaks and other interruptions. Make plans to look forward to after work. If your personal life is tough right now, then the thought of returning home after work could be very stressful. Oftentimes, thinking about how depressing or stressful your evening will be is enough to distract you during work hours, which can have a negative impact on your performance at work. Therefore, it could be helpful for you to make plans for something fun for after the work day ends. Schedule a hike, make plans to see a movie, or invite your friends out for drinks – whatever will help keep you in a good mood. If you have something fun to look forward to, then the thought of going home to an angry spouse, a mourning family, or some other tough situation won’t be so daunting. Instead, you’ll feel a small sense of comfort throughout the day, which should help you to stay focused on the tasks at hand. Your life at home may be a wreck, but that doesn’t mean that your career has to become derailed, too. Although it will certainly be difficult to stay focused at work during tough times at home, the tips above should help you find an effective starting point. I found your advise and suggestions related to the subject matter is really helpful and made me realize that things can be even worse if i loose my focus from work.